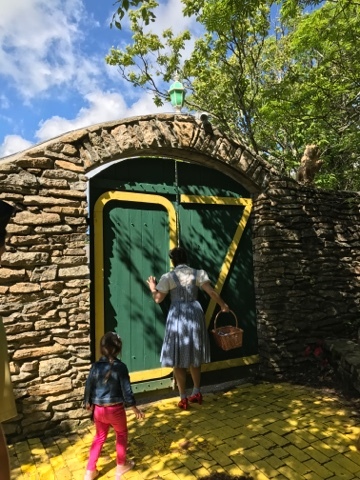 On Friday afternon last week, we visited The Land Of Oz at Beech Mountain. Typically we are skiing on these slopes, so it's interesting seeing them covered in green grass. 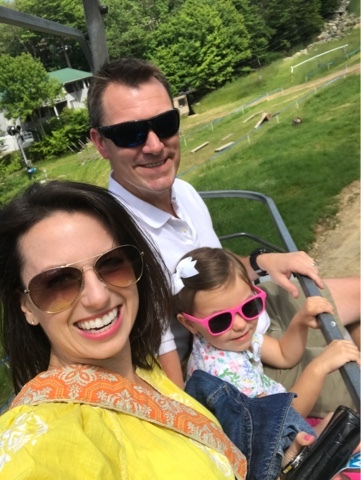 The only way to get up to this attraction is by chairlift, no babies allowed -- unfortunately, Char had to stay home with grandma. But Camille, coming in at a whopping 37.5" tall, was exactly 1.5" over the minimum to ride the chairlift so we made the trek! She was excited to be in the chairlift, and Ian taught her "Bar UP!" and "Bar DOWN!" like the true ski-kid she wants to be. That's what she calls it, ski-kid. We had a crazy grip on her but she was great and safe on the lift. 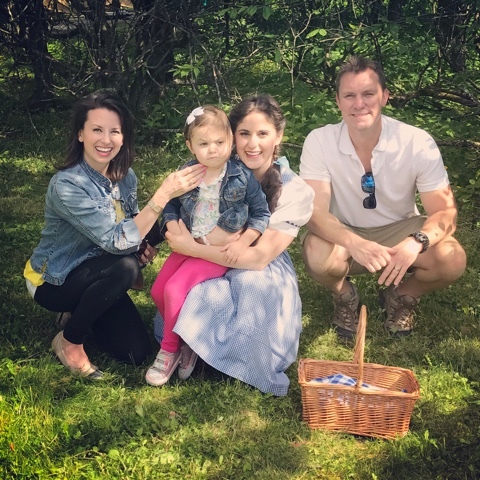 Our attempt at a family pic was thwarted by a toddler with a tongue. 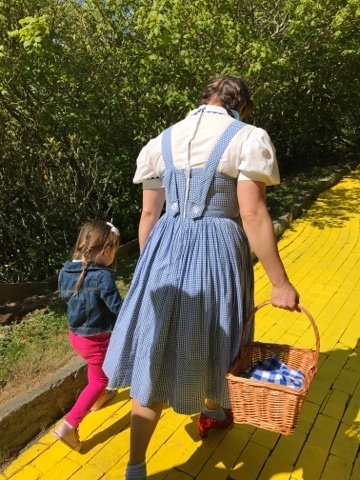 We started our Oz experience at Dorothy's house and made our way through the park. You can read a really interesting history of it HERE. Definitely worth a read. 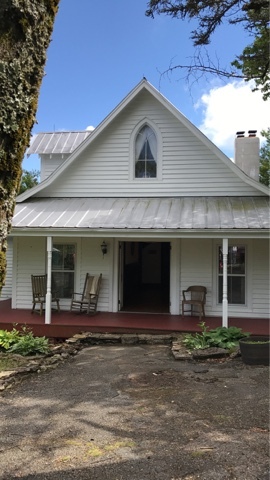 Dorothy came out, sang to a completely hushed crowed, we walked through her house. 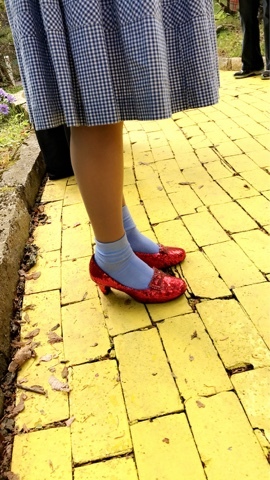 A twister hit, the house was all messed up, and she suddenly appeared in ruby slippers! They had some audience participation and Ian actually played the tin man. It was adorable. He said he never would have done it but thought Camille would get a kick out of it. And she did! 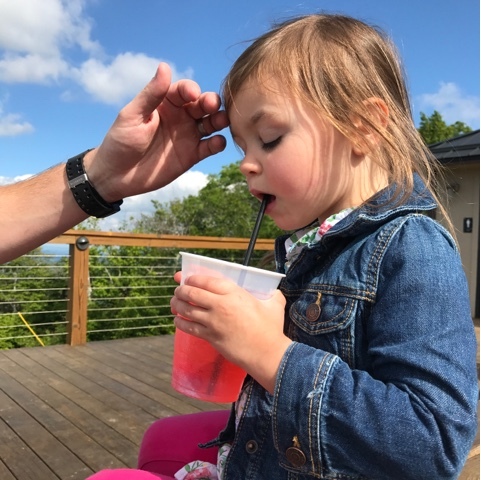 After the tour, we stopped for a beverage at the mountaintop bar before heading back down, and Camille got her first ever Shirley Temple. 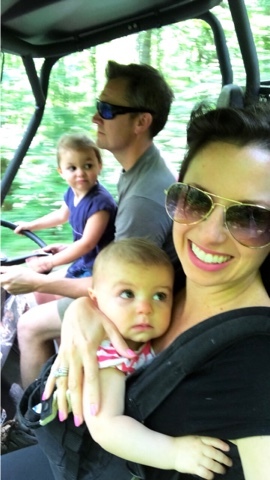 On Saturday we got the girls out for a bit for a fun ride while Camille "drove." 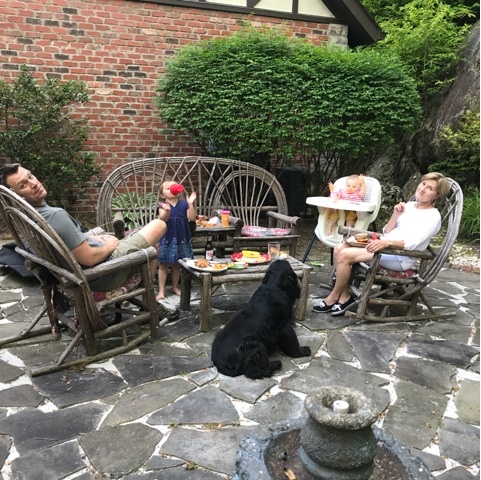 That photo sums up our family perfectly. Camille with no fear, Daddy looking straight ahead, Mama cheesing for the camera, and spider monkey Char clinging on to me. That night we had good ol' burgers on the grill and oven fries and ate on the patio. Ian and I were asleep by 9:15. 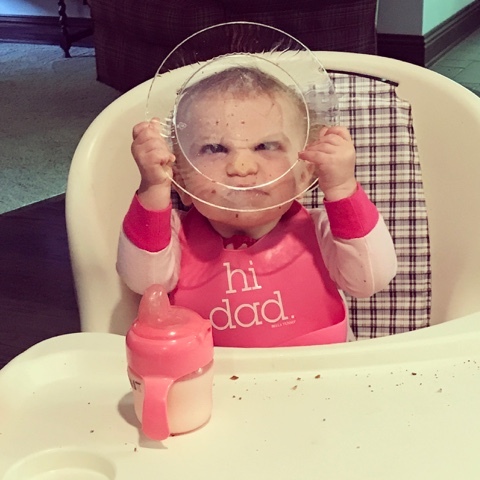 And the next morning, Charlotte entertained us with a clear plastic plate. THAT GIRL. Oh that girl. 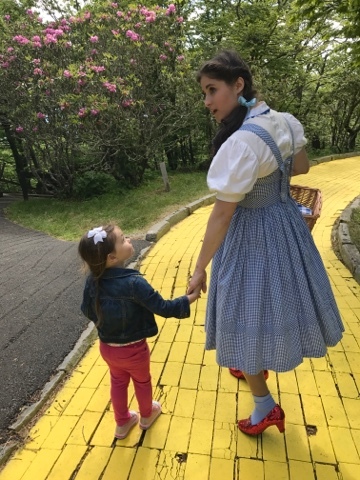 It was a great weekend and I highly recommend a visit to Oz this summer or fall! I love your yellow top! I also never knew a place like this existed, so cool! This place looks amazing! I never knew anything like that existed. I will have to look it up! That picture of Charlotte at the end is HILARIOUS! Walker is doing the whole "tongue out" thing right now and I'm just like, "AHHH!" This looks like a really fun weekend! 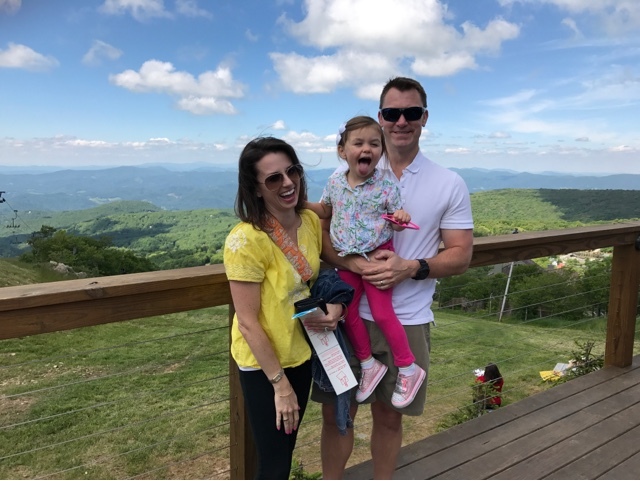 I love Boone, so your vacations recaps are fun for me to read - especially now that we have a toddler! I love getting ideas for things he might enjoy! That is adorable!! 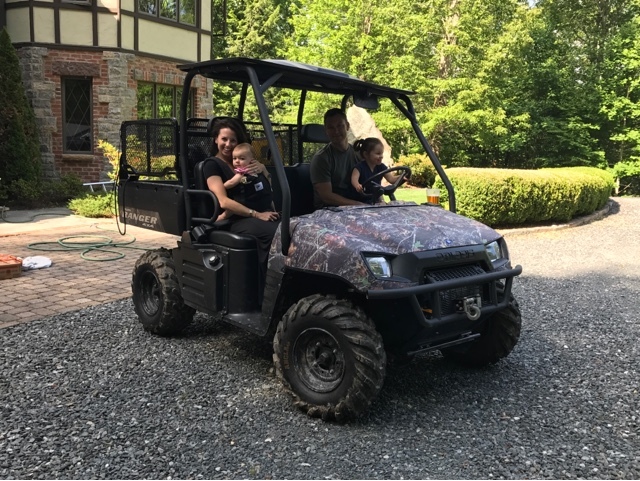 What a fun memory and a perfect family day! I never knew that place existed! 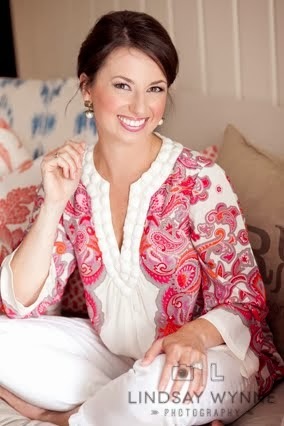 Camille looked like she was in heaven!